Halloween is so much fun. I'm not so into the creepy scariness, but the cute weirdness? Love it. 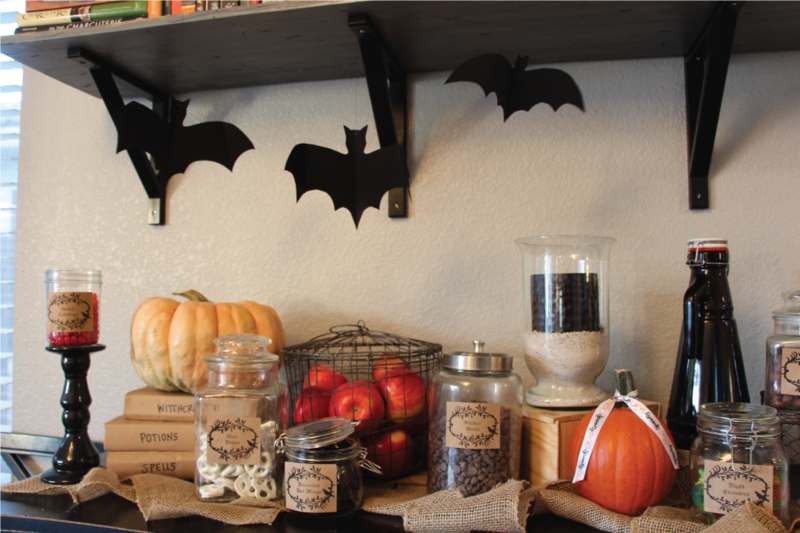 My kids have been jonesin' to decorate since they saw a display in our local quilt shop with all kinds of candy with creepy names (desiccated bat wings, pumpkin teeth, etc) and wanted to have some of the same at home. Today we made it happen with what we had on hand. 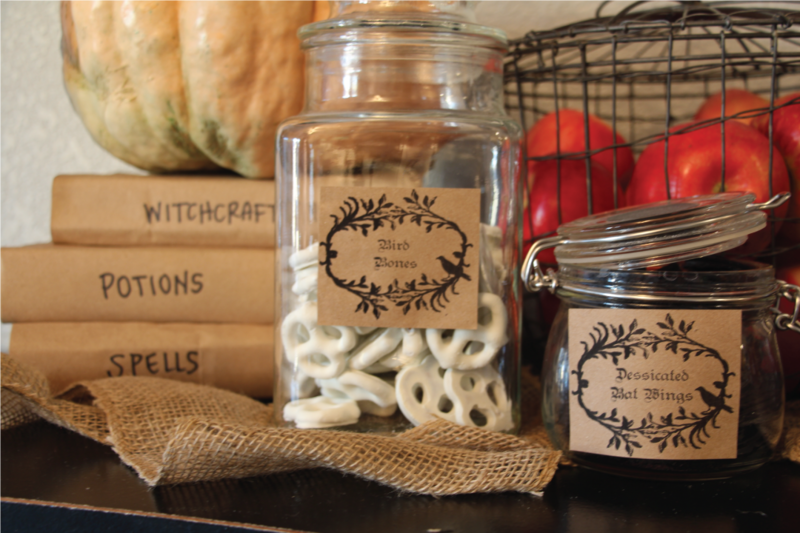 Minus the candy and the pumpkins, of course (that much cavity-inducing sugar just hangin' out in my cupboards? um, no thanks). Step 1 - Start with a blank canvas. 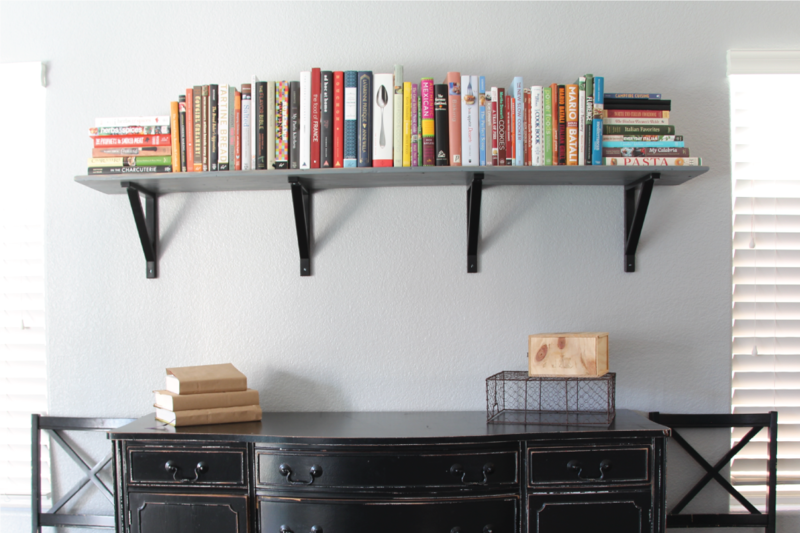 No way I was going to take down all those cookbooks (painstakingly arranged by topic, I might add), so we left those but cleared everything else off the console table. I even dusted it. Woot. Step 2 - Go for height and variety. I wrapped 3 large-ish books in paper grocery sacks (what you've got on hand, remember? ), overturned a basket I had been keeping on the kitchen counter, and added a wooden box I've been using as a catchall for ribbon (confession - there's still ribbon in it). Step 3 - Include texture. I did this with a piece of burlap I had, but any kind of fabric (tulle, too) would work. Even twigs and leaves (if you live anywhere that's not the desert) gathered from the backyard or park would add the right amount of texture and interest. 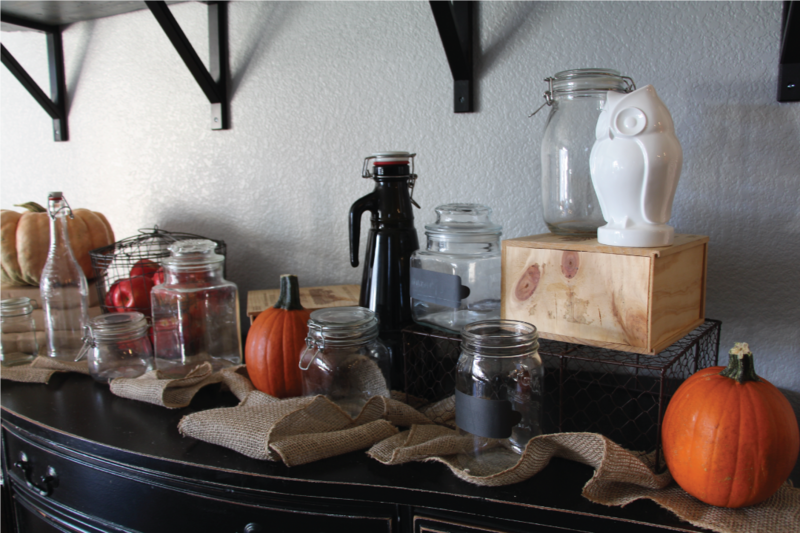 Step 4 - Gather and place all the jars/containers and odds and ends that might work in your vignette. Play with an arrangement until they fit well and/or to your satisfaction. 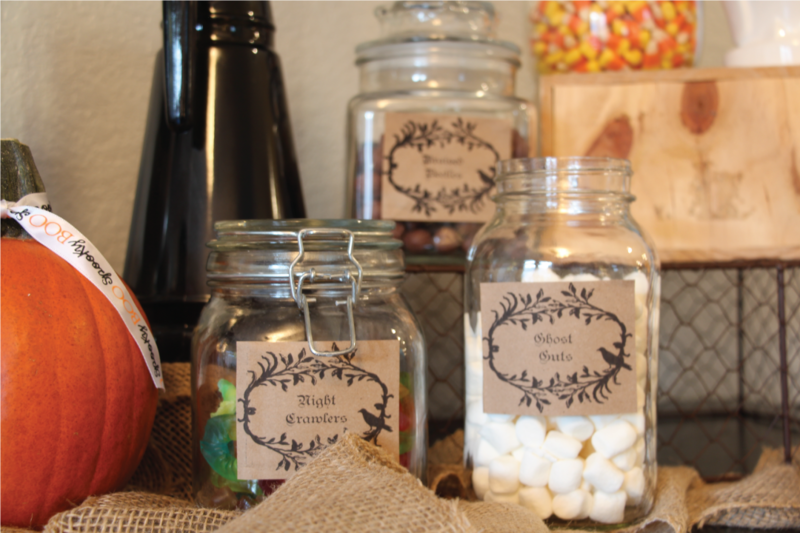 I used mason jars, old candy jars, a juice bottle, even a beer skein from our travels in the Dolomites. I also pilfered the wire basket I keep rags in from the laundry room and filled it with the apples we got at the market this week. I put a pint jar on a candle stick to add more height and dimension. I also put a second wooden box in the middle of the console. I added in the pumpkins (isn't the warty, ugly one on the cooks so cool?) This part is all about experimentation and I did plenty of rearranging and adjusting until I liked how things looked. Step 5 - Fill the jars and add the labels. 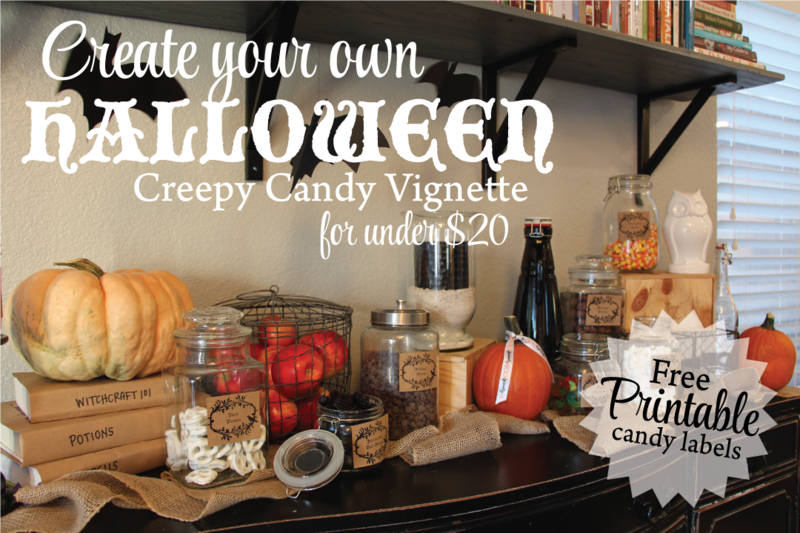 I wanted the candy labels to be equal parts creepy and classy so we made some ourselves. You can download them here and print to your heart's content. And don't worry - if you don't know what boiled ladybugs should be (red jellybeans! ), we've included a little note for each creepy designation so you won't be confused. I didn't want the labels to be stark white, since that didn't fit the whole "aged" and creepy look I was going for. So I cut a paper bag to size and ran it through the printer (what I had on hand). Worked like a charm. I added the candy and stuck on the label with double sided tape. Step 6 - Finish up with details. The book covers (ahem, paper bag covers) were a little plain, so I added titles: Witchcraft 101, Potions, Spells (inspired, no?). I had about 12 inches of Halloween themed ribbon so I tied it around the middle pumpkin. The box in the middle needed something, so I filled a hurricane candle thing with sand (from the sandbox in the backyard) and a black candle I had in the closet. And gee, what's Halloween without bats? We found some black construction paper and roughly following this tutorial, cut out the bats and hung them up with black thread ('cause it's what I had). Spiders would be awesome too, but didn't have any on hand (maybe we'll add them later). 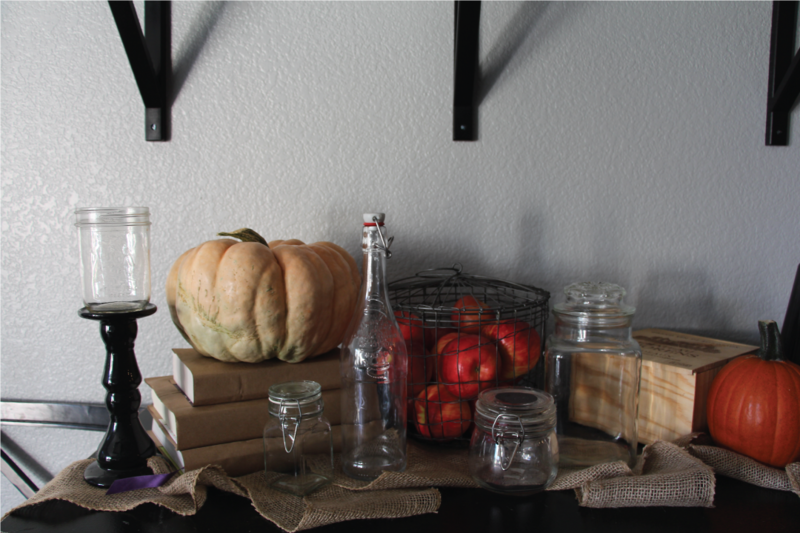 And there you go - a whole Halloween vignette using what we had on hand. We spent under $20 buying the candy in the bulk section of our local grocer and the pumpkins at our local hardware store. The only issue now is how to keep my own goblins from pilfering the creepy goods. Yeesh. 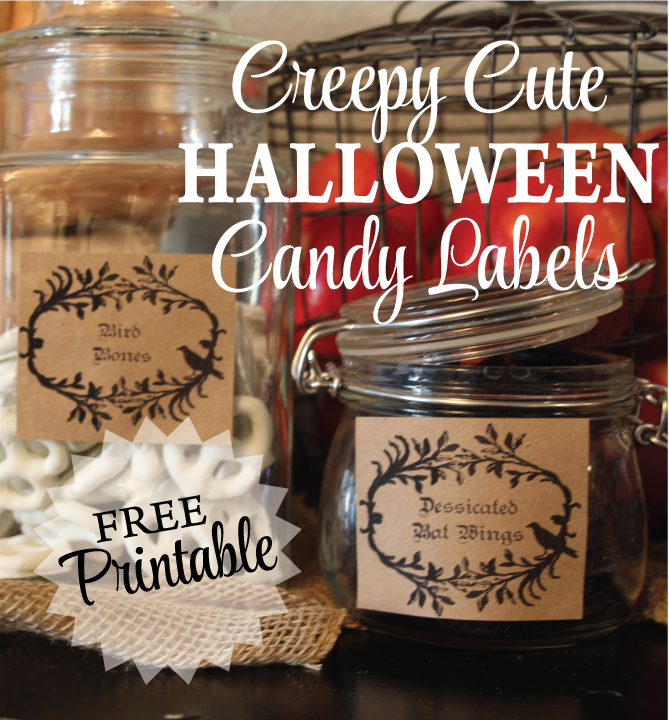 **Download the Free Printable Creepy Candy Halloween Labels here.